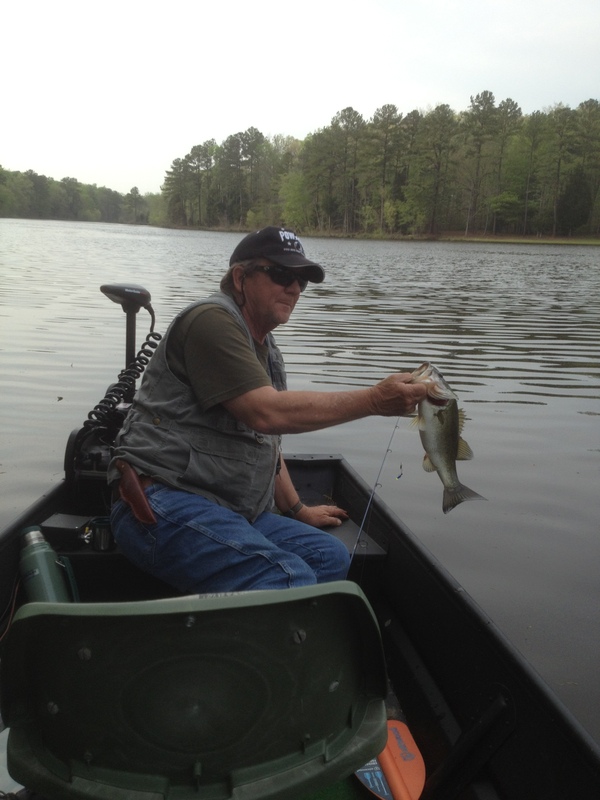 Went fishing with Waldo (my brother Walt) yesterday afternoon, the same morning I left the tubing on the spinner bait. Well anyway, I took all the bass stuff out of the boat. Kept some ultralight spinning reels with four pound test line. 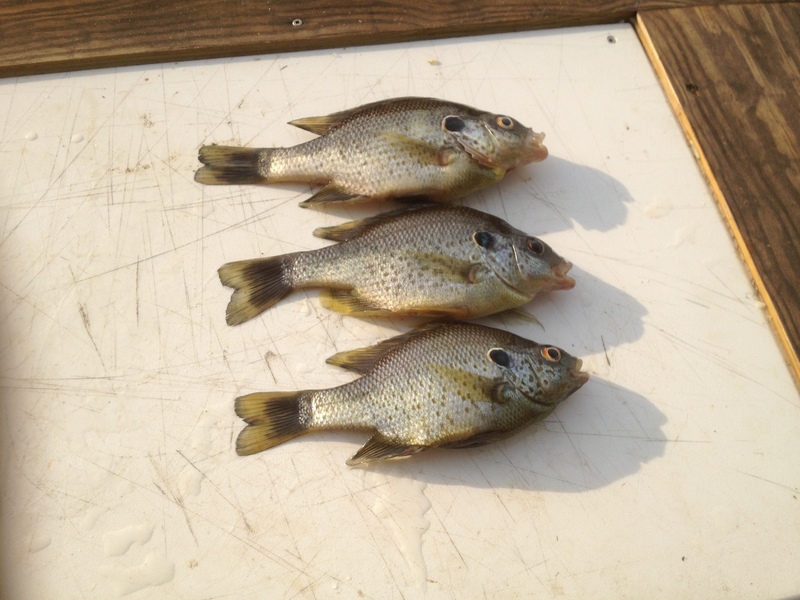 We were after crappie and brim, not bass.We had a good afternoon, catching 41 crappie (mostly small) and 19 brim. The brim were real nice and put up a pretty good fight. When they turn sideways in the water it feels as though you have caught a monster. It’s fun to catch brim with ultralight tackle. When it came time to go Waldo and I were stowing away are rods when I saw a swirl near the bank. It was the same place I had caught the big bass a week or so earlier. I couldn’t help myself I threw a beetle spin right on top of the swirl, and sure enough I hooked a pretty good bass. I would guess that he was the male protecting the nest. I don’t know all the particulars about it but I do know that male bass protect the nest from intruders. After getting my picture taken with my catch I slid him back in the water. I’d been fishing for over eight hours and finally caught a bass on the last cast of the day, Great, just great. After the fun of fishing, comes the chore of cleaning the catch. There is a pretty good cleaning station set up overhanging the water. receptacles for the electric fillet knives are provided and a hose pipe for clean water. Being able to clean your catch at the water’s edge is so nice. I cleaned about 20 crappie then Waldo asked to try his hand at it. Walt never cleaned a fish in his life, so I was a little surprised he asked. I gave him a little instruction on his first two fish, after that I wasn’t needed because he took to it like he had been doing it his entire life. I am blessed to have a fishing partner in my brother, and now that he can clean fish it is that much more fun…Wonders never cease…My brother and I, both Viet Nam veterans thank you for the welcome home! 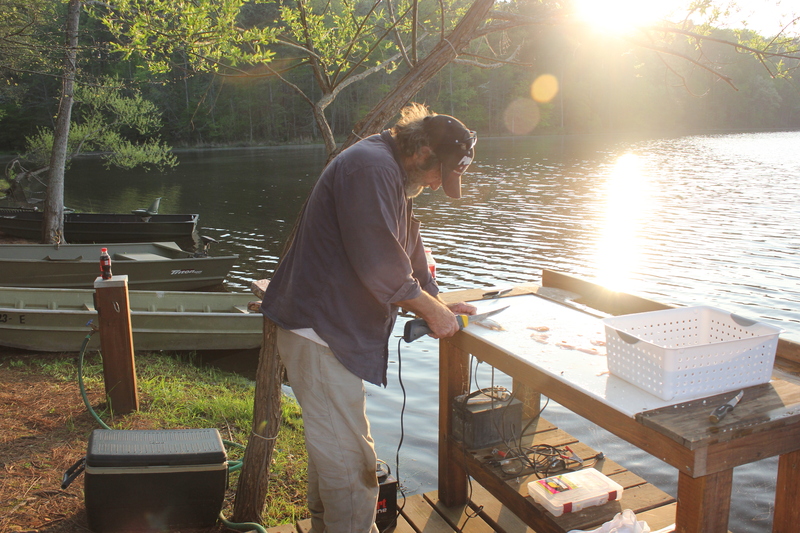 This entry was posted in Fishing and tagged Crappie, Family, Fish, Fishing, Outdoors, Recreation by Mud. Bookmark the permalink.